Listing 7.6. CGI script that displays a graphical hit counter. which will appear in the browser as in Figure 7.3. Figure 7.3. 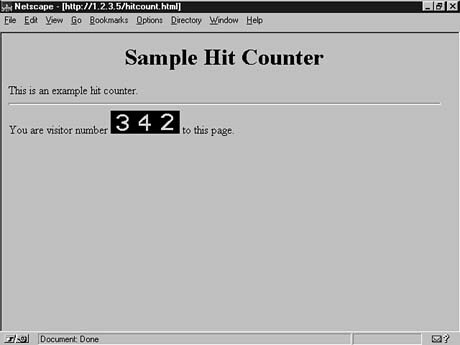 Demonstration of a graphical hit counter. You can also use printf formatting to pad the number with zeros prior to producing the image string. This would give the effect of an odometer look. You can decrement the counter by using the dec method. You can also use the value method to peek at the counter value without incrementing or decrementing the counter.